One of the fastest developing parts of the world, the Middle East and Africa is an important focus for SSP. Increasingly high standards and the growing recognition of the importance of international brands mean that the area presents a wealth of opportunities. In 2013, SSP consolidated its position in the region with a major contract win at Qatar’s Hamad International Airport. Doha’s new Hamad International Airport serves one of the world’s fastest growing economies. Its opening in 2013 was one of the most high-profile of the decade. In March 2013, SSP agreed a deal to operate 11 food and beverage outlets at the new facility. These include a number of international brands, alongside a selection of SSP’s own concepts. The mix has been designed to appeal to the airport’s cosmopolitan visitors, of which a large proportion are transit passengers. The new airport became fully operational at the end of 2013 when Qatar Airways moved its entire operation to the new facility. 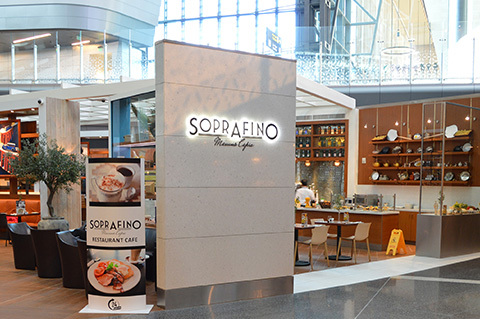 Brands featured: Soho Coffee Co., Burger King, Caviar House & Prunier, Le Grand Comptoir, Soprafino by Massimo Capra, Red Mango, Camden food co., Qataf Café, and Food Village (with various brands to suit all tastes). Sharm el-Sheikh International Airport is the second busiest airport in Egypt after Cairo. It is served by two terminals, Terminal 2, which is the airport’s original terminal building, and Terminal 1, which was opened in 2007. It is used by local and international travellers from a diverse range of countries, including a large percentage from Russia. SSP is the exclusive food and beverage operator at both of Sharm el-Sheikh’s terminals. It operates 18 brands to meet the needs of all types of passenger. The company also operates lounges in both terminals. Brands featured: Burger King, Caffè Ritazza, Café Select, Upper Crust, Negroni, Smoking Lounge, Juice Bar, Flamen Gril, Sports Bar, Fresco, Negroni, News Bar, ToGo, Fresco, Café Express, and Bill Bentley. Abu Dhabi International Airport is the second largest in the United Arab Emirates, and one of the fastest growing airports in the world. Abu Dhabi’s Terminal 3, which opened in January 2009, provides a handling capacity of over 12 million passengers. In 2016, SSP won a contract to operate 17 brands at the airport’s spectacular new Midfield Terminal Building. SSP also operates Brioche Dorée and Flavours in Terminal 1. Brands featured: Camden food co., Burger King, Shawarmanji, Negroni, Yum Cha, CNN Traveller Café, Montreux Jazz Café, O’Learys, Flavours, To Go, Ritazza, Jaipour To Go, and Brioche Dorée. 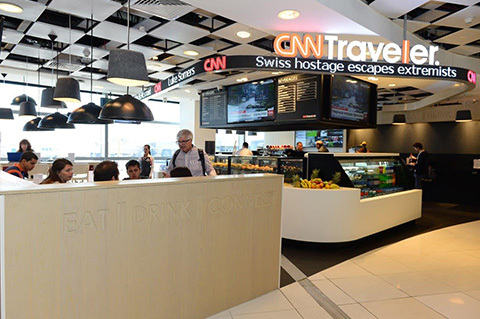 SSP operates brands at Dubai International Airport’s Terminal 1 Concourse D.
Brands featured: CNN Traveller Café, Butlers Chocolate Cafe, Caviar House & Prunier, YO! Sushi, Brioche Dorée, Camden food co., and Shawarmanji.